Melmac and the Reverter brothers are old friends of hinah's, as the label released one of the band's first recordings: hinah003 - P1 vs P2. Back then, the lineup only included Luc and Nicolas and they played minimalist electronic music. Nearly 16 years later, Melmac has grown into a quartet, with Jean-Yves Davillers (drums) and Quentin Rollet (saxophone) recently joining. The sound has also changed a lot, combining noisy guitars, experimental sounds and free jazz. 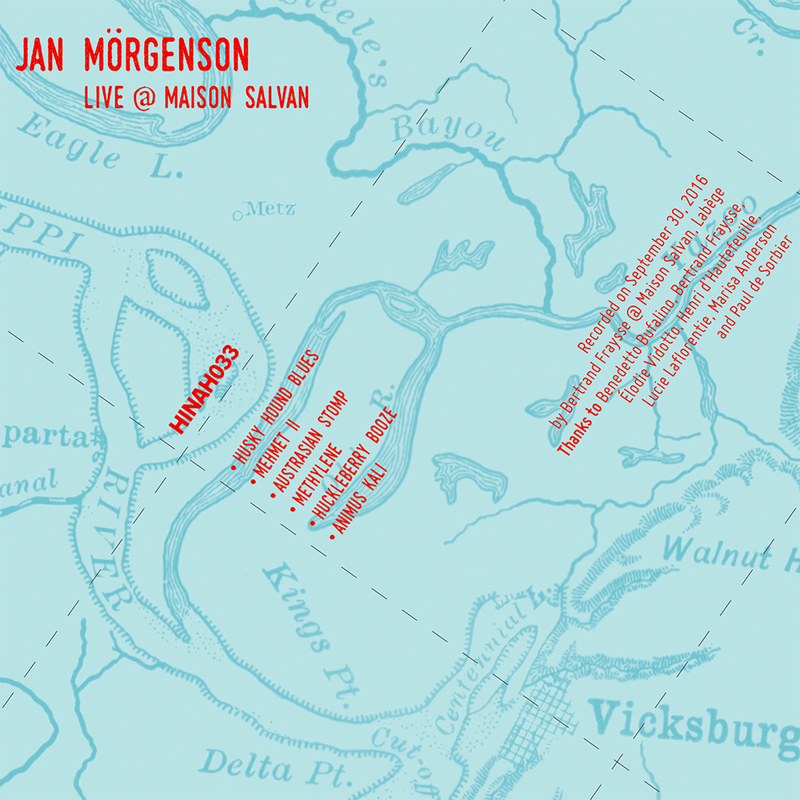 It is with "Mehmet II", a track on his last album, that we discovered Jan Mörgenson - from Metz, France, but originally from Denmark. While undeniably influenced by John Fahey and Jack Rose, this track also shows a true personality which is also noticeable throughout the album, "Jass, Raag & Blooz", released early 2016 on Specific: a trip through America and its "Primitive Guitar" but also slow rides in wide open Asian arid spaces and a couple of high-altitude excursions in unexplored, hostile territory. For this release, we have asked Jan for a live recording of his songs. So here is one of his latest sets, recorded live in the South of France, at Maison Salvan in Labège, where you can rediscover most of his last album. 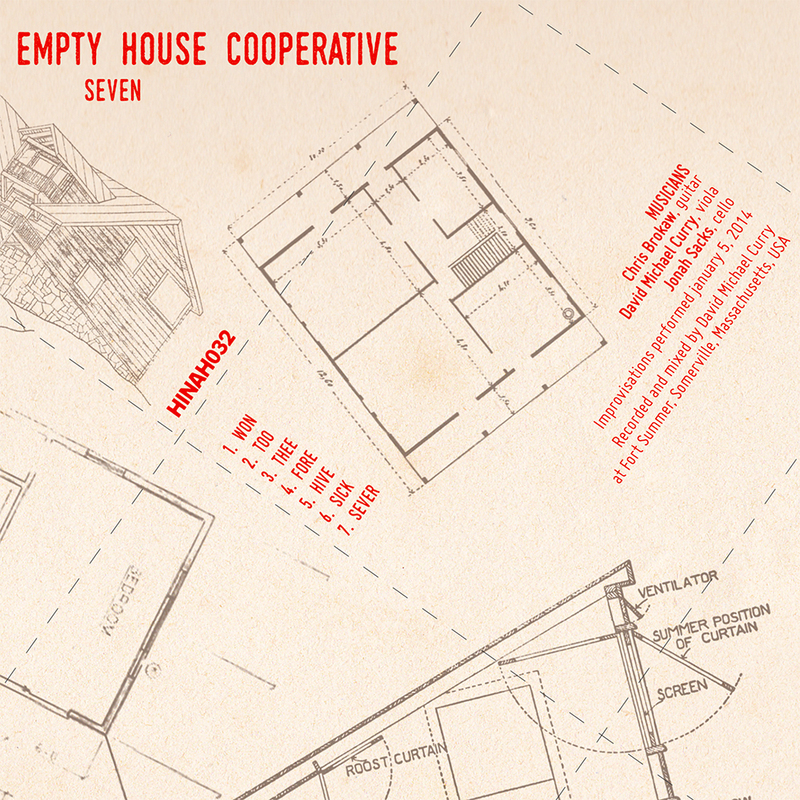 Empty House Cooperative "Seven" is a document of one of the core trio's many gatherings. The titles are a play on words, mixing imagistic language to rhyme with the numbers, with "Seven" being both, as the number 7 is my secret soothing obsessive-compulsive fixation number. We've developed our unspoken "just do it and enjoy it" musical language over the 20 years since we began as Sunday jam sessions in 1996. I had a vision to invite musicians that I trusted or had a good vibe about to explore improvisation with minimal guidelines in a loose collective with an ebb and flow of both sound and membership. Approximately 30 people have been involved over the years. Regulars have included musicians Craig Colorusso and Thalia Zedek, some old friends from the band Molasses & others of their Montreal scene, and social justice activist Brian Corr, whom I met in Jumbo, a Boston rock scene circus music band. From EHC's inception, the heavy foundation and floral scrabbles of Jonah Sacks' cello, the structure and deconstruction of Chris Brokaw's guitar, and DMC's viola, loops, howling & singing feedback, electro-acoustic noise & obsession with effects pedals have been the heart of Empty House Cooperative. Thanks to hinah for their support at the beginning and now these many years later. All along the way, EHC concerts and home sessions have been recorded & passed out to friends in brown paper lunch bags. The full archive will someday see the light of day. You may have already come across Lille-based Julie Fossaert as part of the peppy band Peru Peru, or heard her much more intimate solo project named Rêve ("Dream"). On "R&A", she appears stripped down although, paradoxically, she is joined by many guests (Eric Chenaux, Valérie Leclercq, Claire Vailler, McCloud Zicmuse, Myriam Pruvot... and many more) on songs that were recorded in many different places (Lille, Nantes, Dunkirk, Paris, Nancy and Villeurbanne). Each track has its own atmosphere, its own tone colour, its own connection with Julie's world -- from the slender "Hotaru Kana" to the more cheerful "Keep On Doing What You Do / Jerks on the Loose". 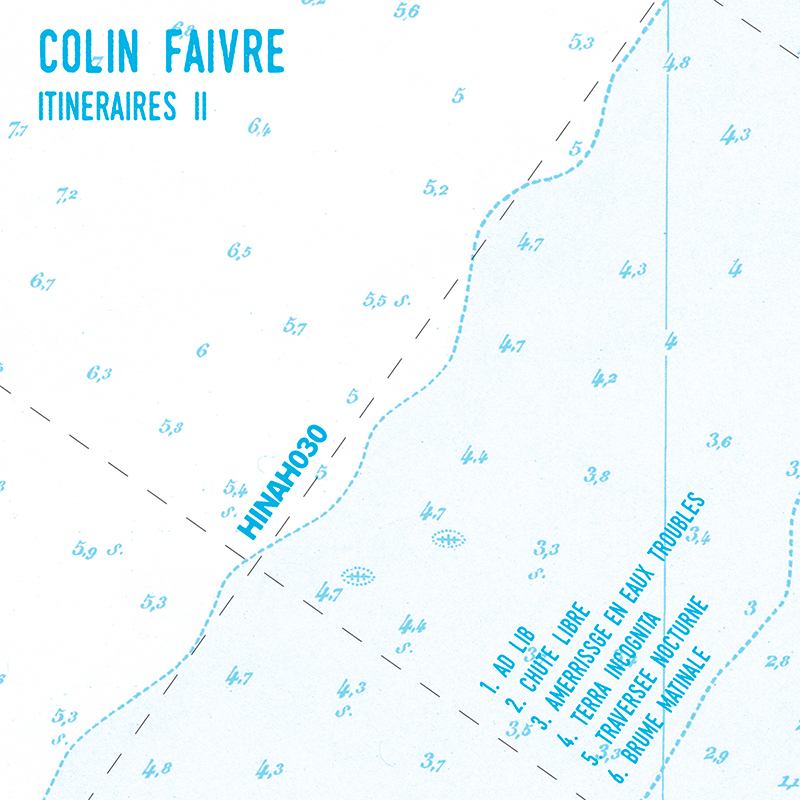 After seven years of hibernation, this is our first release under the new version of the hinah series, recorded by a French musician, Colin Faivre. Colin plays the baritone banjo, however not in a traditional manner. He likes improvising and experimenting, unfurling deep sounds, casting an ear towards Indian ragas or Middle-Eastern music, taking us in flights of arpeggios and wild rides, or on the contrary delivering much more parsimonious notes to let the listener enjoy internal journeys. We discovered Templo Diez thanks to an exchange of records with the French label Intercontinental Records, which had released the band's debut album "Hoboken". Three years later, while hinah was on a sabbatical year, Pascal Hallibert sent us the new cd of Templo Diez, "Winterset", on which we especially loved the beautiful song "Sal". We suggested we could put out an EP if they felt like going for more acoustic tracks and putting the voice of Gloribel Hernandez (who was also singing on "Sal") more upfront. And they agreed! Every rigid rule is bound to be broken some day. We had promised to release only one recording by artist in the hinah series but LunDi is the first project to run counter to the concept, with a second CD out on hinah! Two years after "Mobiles/motifs", Claude-Marin Herbert is back with his fourth EP, precisely named "4". These five tracks benefit again from Claude-Marin's impeccable lyrics, but this time the piano is much more upfront, except in "Axes" and its sharp guitars. "How Else Can We Escape?" Although a bit more than a year ago we announced the end of the hinah series, it is back again! And as we are now located in Germany, what better way to start again than with a band from Nuremberg? It is true that The Green Apple Sea is a German band, however it sounds more like an American folk band successfully enhanced with pop melodies and the warm, sweet voice of Stefan Prange (who was also the bassist of The Transmissionary Six during their latest tour in Europe). We also stronglly recommend their new album "Forever Sounds Great", that will come out on Skycap Records in March. We first discovered this project from Phil Spirito (ex-Rex, ex-Loftus and a member of Califone) in a record shop, wondering what was that homophonic band (our surname is Orseau) with a beautiful sleeve showing a bear ('orso' in Italian), a beehive and, of course, bees annoying the massive plantigrade. We became even more intrigued and interested as we explored their raw folk music, with an upfront banjo playing unusually slowly and creating a constant unease. After three albums, and especially since their latest cd, the brassy "My Dreams Are Back And They Are Better Than Ever", oRSo has evolved towards a more "open" sound that introduces some fresh air in what remains a mostly arid environment. We bought James William Hindle's debut album on trust in his record label (Badman, which had just released albums by Mark Kozelek and Paula Frazer) and in the beautiful sleeve à la Red House Painters. When we got home, we looked at the booklet and found out that the artwork was done by our comrade Matt Dornan from Comes with a Smile. That was definitely a very good start. As for the music, we totally fell for James's folk songs and catchy melodies. We loved his very soft voice, and his cover of the Bee Gees' "I Started A Joke" was such a gem! So, when he got in touch with us and offered to record something for hinah, we obviously welcomed him with wide open arms. Here is this one-off object, a collaboration with James Green from Big Eyes. LunDi is the solo project of Claude-Marin Herbert, a young man deeply inspired by the delicate music of pop heroes such as Mark Hollis and the Nits. It is no surprise that this project reminds us of a band like Bed (who is quite undeniably influenced by Mark Hollis), yet with a noteworthy difference: Claude-Marin's lyrics are in (beautiful) French. For this new recording (his first ep "Cendres ascendantes" is available in the hinah gift section on hinah), LunDi keeps exploring the piano/voice association, but with also a few surprising - and successful - twists, especially on the chorus of "La Nebbia". Last year, Tami Means sent us her debut album, which began with a cover of Elizabeth Cotten's "Freight Train" -- a song that Peace Harbor had already covered on the big "Voices From The Light" EP that we released (incidentally, we very much recommend Elizabeth Cotten's own recordings). That was a very good beginning! And the remainder of the album was quite as charming, slow slender folk music led by an intimate, softly deep voice. On this new recording, Tami's music remains mostly folky, but with what is now her regular band, she gives way to more tender, latin, and even jazzy moments. Kenyon is the project of Pierre Laplace, who is already well-known around here as the former singer of Vera Clouzot (who recorded the very first cd in our hinah series) -- and he also recorded a hinah session as Kenyon back in 2003. Although the last songs from Vera Clouzot were written in French and leaned more towards rock, with Kenyon Pierre has come back to his original songwriting: folk songs with lyrics in English. "Catch A Star" is a collection of straightforward, stripped down ballads. We literally fell for Arman Méliès's debut folky and delicate mini-lp "Le Long train lent et les beaux imbéciles". Above all he has this impressive gift to mix two usually incompatible fields: lyrics in French and deeply American music. 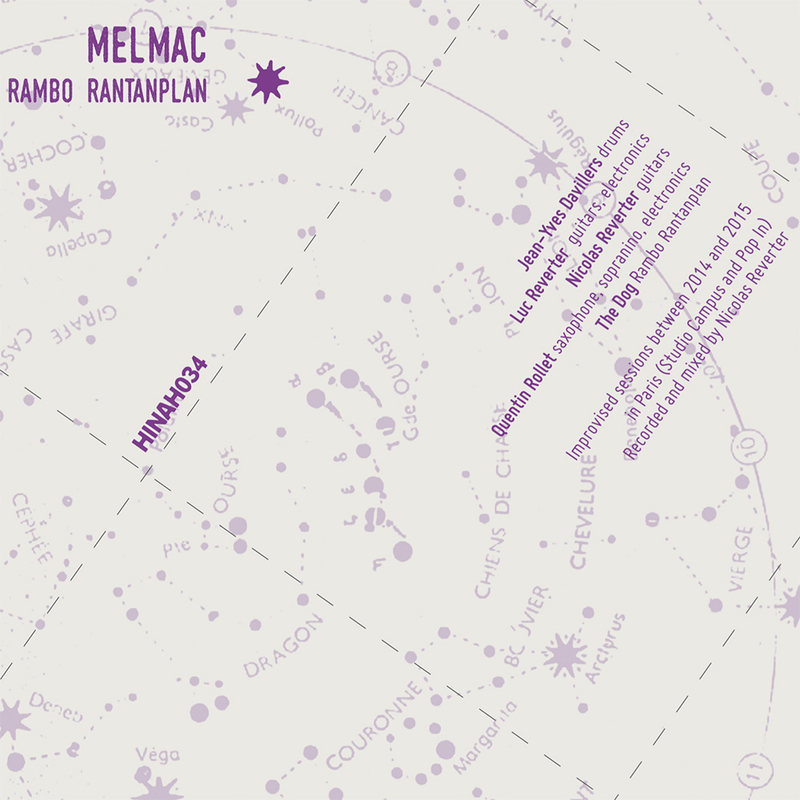 C'est quand même bruyant par ici is the project of two multi-instrumentists from Marseille, Pascal Ferrari and Yves Miara. Its kindred spirit could be Amor Belhom Duo on their "black" album: plenty of soundscapes, ideas spreading in various directions, and in the end quite a personal sound. On its eponymous debut album, the quiet ethereal music of Canada's Barzin blends warm folk music à la Mojave 3 with the sweetness of Spain and much colder atmospheres à la Low and Mazzy Star. "Train in Vein: Bleecker-Era Outtakes"
We've immmediately loved Greg Week's first albums, with his Nick Drake kind of guitar picking and voice (and it really is a compliment). Since then, Greg has stepped on another track, adding more psychedelic elements to his folk music. His beautiful voice and songwriting are still as wonderful as ever. Between two recording sessions for his band Gliss, Martin Klingman goes stripped down: he just plays sparse notes on his acoustic guitar to produce lo-fi (but silky) folk music, and lets his high-pitched, nearly feminine voice, caress our ears. Possibly a cross between Devendra Banhart and Hope Sandoval? "Just Before We Learned To Swim"
The project of Belgium's young Valérie Leclercq, Half Asleep, drags us into a woolly universe where life keeps the soft pace of guitar and piano loops. Her (filled to the brim) debut demo we received last year reminds us of our excitement upon first hearing such great ladies as Tara Jane O'Neil, Julie Doiron, Stina Nordenstam, and Lisa Germano... say no more! "3.02 VS 2.22 = 25.16 ?" SZ is the solo project of Franck Litzler, former quitarist/bassist and co-founder of NATSAT (a post-rock band from Tours, France, that played with The Ex, Trans Am, and Shipping News). After moving from Tours to Grenoble, Franck started again a project that he'd first started in 1992 when he bought a 4-track recorder: Franck recorded everything he could, sampling, twisting, and mixing sounds he'd gathered during travels to India, Iran, South America, with electronic pieces and acoustic instruments. You can get carried away softly in these sweet melodies... or else jolt along these bumpy tracks. A SZ album is due out on France's label Drunk Dog in the fall of 2003. We discovered Zak Riles when Norfolk & Western (another band he plays the banjo and the guitar with) came over for a hinah session. We were deeply impressed by the two songs he played that night, two tracks haunted by John Fahey's ghost. On this recording, there is still the spectrum of the "American primitive guitar" hero, but also much more singing which should delight those who love Nick Drake, Mark Kozelek, M. Ward, Rivulets, and of course Norfolk & Western! A few months ago, Anamude -- aka Ana Hortillosa, as she's the only one behind that name -- sent us her first 5-song ep. The only comparison that springs to our minds about how we felt when we heard to it, is our reaction to M. Ward's first album: light raw folk music, a beautiful guitar picking and a terrific voice! We discovered the simple and direct folk music of Alex Gwinnett (an Englishman settled in France) in a tiny Parisian venue, le Pop In. We loved his songs so much that we went to see him at the end of his set, asked him to send us some recordings and, upon hearing them, decided to book him for the first release in 2003. Funnily enough, without even listening to the album that Natural Snow Buildings sent us, we already felt on familiar ground. Maybe quite simply thanks to the plain information that came along with their album: just a sheet of tracing paper with the titles and the instruments, typed with a typewriter font. And the osmosis wasn't denied, as we fell for these long atmospheric tracks, mostly based on a guitar/loops/cello trio. The Potomac Accord's first album sat in our letterbox when we came back from holidays in 2001, it was mid-September... It soon became the perfect album to match our state of mind, which was by no means cheerful. The band's tracks were long, stretching, starting again after a short break, with swirling loops of piano, until now and then it burst out into an anger that could no longer be repressed. So we were overwhelmed by this band from St. Louis, and it's a great pleasure for us to discover live versions of these tracks. Let's make it clear: Devendra is a crazy folky minstrel and an inveterate traveller (Texas, Caracas, Los Angeles, New York...). We discovered him by chance as a support act, and later it chanced that he sent us a tape together with a marble, wrapped up in an envelop from the French Treasury. Devendra's music is folk for sure, but it leaves free rein to its madness, its rhythm breaks and a Marc-Bolan-like voice. Note that Young God Records will soon release an album from Devendra, with a name that matches its author: "Oh Me Oh My, The Way the Day Goes by, The Sun is Setting, and Dogs and Dogs and Dogs are Dreaming, Love Songs of the Christmas Spirit". La Nuit Américaine is an Italian band -- more precisely from Bologna -- which formed in 1999 and whose head and most arms and legs are led by the dark Christian Govoni. This band's music is located halfway through between the early 80's new wave (especially with Christian's deep voice and the sombre atmospheres) and the sound of groups such as Arab Strap, Piano Magic, and Migala. This music is gloomy, in pain, and oh so harrowing. Transmissionary Six is the project born of the meeting of Terri Moeller, drummer from the folk veteran Walkabouts, and Paul Austin, who lately quit Boston's Willard Grant Conspiracy. After a debut album out recently on FILMguerrero, the band is so kind as to give us this recording, which the fans of the Walkabouts and WGC should love -- and so should those who adore the Red House Painters or Mazzy Star. In a nutshell, it's stretched folk music with insistent loops, elevated by Terri's voice in a distance. Exactly one month after All Saints' Day, Donna meets up in a bedroom in the 13th district of Paris in order to record -- in two days and with Death as a sole theme -- nine spontaneous shimmering tracks. 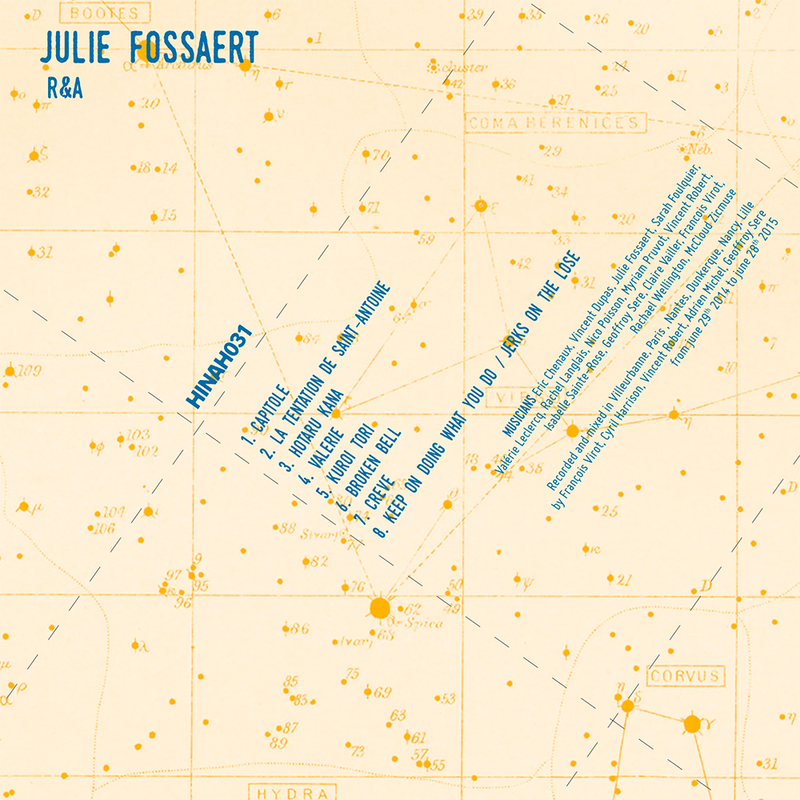 This release is a recording made at the studio of WMBR 88.1 FM radio at Massachusetts Institute of Technology in Cambridge, Massachusetts, on August 28, 2000. The musicians on that day were Chris Brokaw (electric guitar & feedback), David Michael Curry (viola, guitar, horn, loop samples), and Jonah Sacks (cello). The recording engineer was Andy Hong, from the "Pipeline" radio show. "Live at the Abbey Lounge"
Although Magic 12 originate from Boston, their influences are not to be found in that city's rock scene. Instead, they turn towards two islands, Great Britain and Australia, that gave birth to two pop giants: the House of Love and the Go-Betweens. Following in these masters' footsteps and thanks to a very much upfront piano, light melodies and witty intimate lyrics, Toby Ingalls and his four comrades deliver delicate songs... undeniable sweets. Doug Hoekstra cites his main references as The Beatles, Bob Dylan, Leonard Cohen, Van Morrison and The Kinks and on listening to his work, you can believe him. The adopted Nashvillian has taken the influences of the songs and rhythms of folk/country/pop and the results, while remaining loyal to the musical main line are highly personal creations; the songs which lean on Doug's sweet and delicate voice (helped by feminine backing vocals) whisper the ordinary stories of everyday life. Vera Clouzot is a band from Lille, Northern France. They began as a three-piece band (vocals, guitars and cello) influenced by American folk bands such as the Red House Painters, Smog, American Music Club. They released two self-produced albums in English, and then an album in French, with a more personal sound, in 2000. They're now a quintet, with a jazz drummer and a bass player.